Shapefile is a vector GIS format developed by Esri. It stores geographical information data. Shapefile have three geometries point, line and polygon. GIS data can be stored in different formats and the conversion of data from one format to other is also possible. 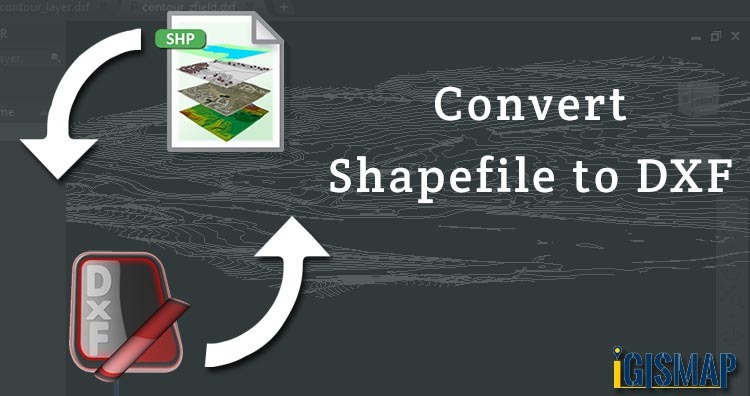 So in this post we convert Shapefile to DXF. Before conversion lets know what is DXF ? DXF is a CAD (Computer Aided Design) file and it stands for Drawing Interchange Format or Drawing Exchange Format. It is drawing interchange files used to transfer data between various application. Go to IGIS Map Tool login with registered email id and password or register if you are new user. After that you will directed to the dashboard of tool. Tap on Switch To button on the right hand side of the screen and select the Converter from the drop down list. In the next screen Upload your shapefile using three options first is drag & drop or browse from the system, 2nd is upload from google drive and third option is drop from Dropbox. **If you are GIS student and looking for GIS data then Download Shapefile free. After upload next step is of selecting the desired output and you alter the CRS (Coordinate Refernce System). After selecting all fields tap on Convert File. File is now converted and published on map. Here, you can download the converted file. If you are facing any problem in conversion or login then please let us know by mailing at juhi@igismap.com or drop comment. Author Juhi AcharyaCategories GIS, GIS Software and Tools, IGIS Map Tool HelpTags What is DXF ?